Several different things have come my way at the exact same time that are sorta like decimal time apps, but not exactly. 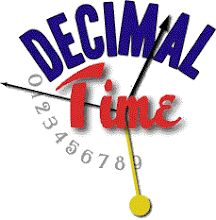 Decimal Time 1.0 by Harald Mueller is a 99¢ iPhone app which does not display decimal time. Rather, it represents standard 24-hour time as four columns, one for each digit. Each column has a number of binary indicators that indicate the digit, depending on the maximum number. For instance, the first column has two indicators, representing 2×10, and the second column has nine, so that the hours 0-23 can be indicated. The next two columns are for the minutes, so one column has five and the last has nine, for minutes 0-59. Get it? If you are looking for a real decimal time app, don't get this one! At the same time, I saw this tweet by Oliver Bothwell directing me not to an app in the iTunes app store, but to a "Metric Time" web app, which is basically a web page that works on iOS devices. He says it's optimized for iPad, but it works on my iPhone. I find that it does not work on all Windows or Linux browsers, but it does work on Safari and Chrome. What is much more interesting is his Metric Diary, which not only uses decimal time, but also a decimal, or "metric", calendar, with ten-day weeks and ten months per year alternating between 35 and 40 days. This is all explained on his metric poster. The final entry is the Metric Clock Widget for Android by Dan Perron. I'm not able to check it out, but it's one I'd like to have. There are few widgets for iPhone, and those are only if you jailbreak.